It took nearly the entire game, but the Yomiuri Giants finally found the solution to their Hiroki Kuroda problem. 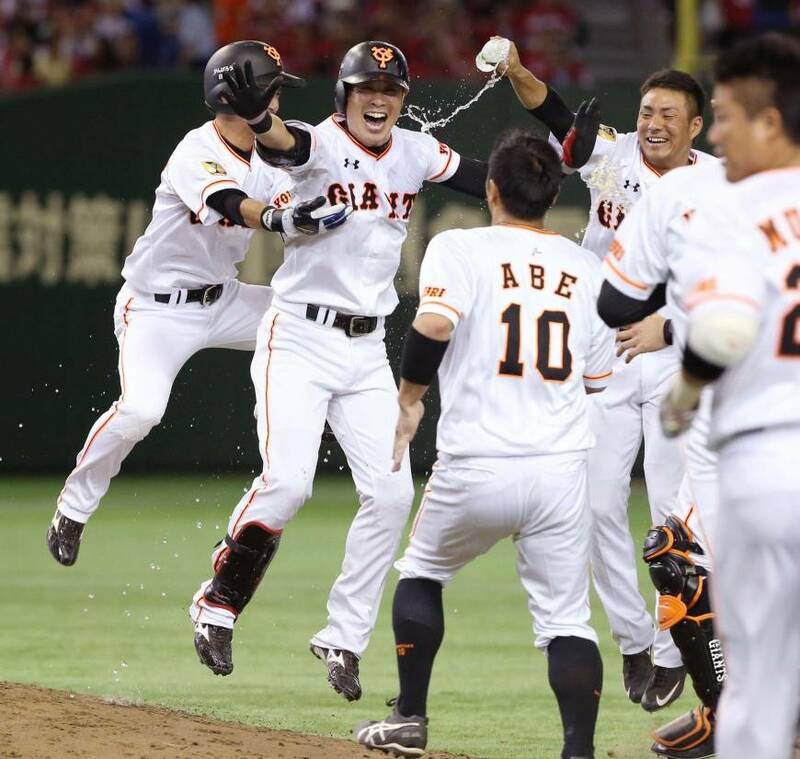 Shinnosuke Abe hit a game-tying single with one out in the bottom of the ninth and Yoshiyuki Kamei delivered a sacrifice fly to end it as the Giants upended the Carp in the final frame for a 2-1 victory on Tuesday night in front of a crowd of 42,858 at Tokyo Dome. “It’s been a long time since we won a game like this, pulling it out in the ninth inning,” Giants manager Tatsunori Hara said. Kuroda was facing the Giants for the first time since returning from eight seasons in the major leagues and entered the ninth inning trying to put the finishing touches on a shutout. The Kyojin, who had managed just two singles and a double at that point, had other ideas. Hisayoshi Chono began the frame with a single to right and was lifted for pinch runner Takahiro Suzuki. The speedy base-running specialist caught Kuroda’s eye at first base, with the Carp hurler throwing over several times to hold him close. “We have to use our speed to win games and that paid off for us tonight,” Hara said. After Soichiro Tateoka struck out, Hayato Sakamoto came through for the home team with a hit that left runners on first and third. That brought Abe to the plate, and he tied the contest with a single to right, as Sakamoto went from first to third on the play. “I wanted to make the most of that chance,” Abe said after the game. Kamei swung at Kuroda’s first pitch and lifted a ball into left field that was deep enough to bring Sakamoto home as the winning run. For the Carp, it was a tough pill to swallow. Kuroda (6-3) was charged with the loss, his first losing decision since May 1. The 40-year-old was in vintage form at times during his 8 2/3-inning outing. Kuroda struck out nine and walked one. Giants rookie Hayato Takagi went toe-to-toe with Kuroda for most of the night. Takagi (6-5) threw eight innings of one-run ball, striking out nine and walking two. The right-hander snapped a three-start losing streak, but finished outside the decision. Takagi hasn’t won since May 24. Scott Mathieson (2-4) retired all three batters he faced in the ninth and got the win in relief. The Giants’ Hisayoshi Chono finished 2-for-4 to post the only multi-hit night for either team. Outfielder Yoshihiro Maru put the Carp in the driver’s seat in the eighth with a solo homer to center, his 11th of the season. Maru has seemingly gotten his groove back after sputtering through the interleague portion of the schedule. Maru is hitting .481 with three home runs and eight RBIs in the six games the Carp have played since Central League play resumed. 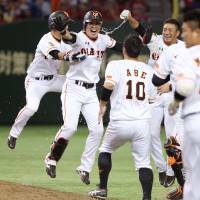 The Giants returned to .500 (37-37) with the victory as they chase the first-place Hanshin Tigers in a crowded CL. The top five teams in the league were separated by just 3 1/2 games going into to Tuesday’s games. Keiji Obiki went 2-for-4, including a tiebreaking single in the eighth inning, and had three RBIs as the Tokyo Yakult Swallows edged the visiting Hanshin Tigers 4-3 on Tuesday night in the Central League. As a result, Hanshin’s six-game winning streak was halted. At Okinawa Cellular Stadium, Yokohama’s Yasutomo Kubo (5-4) scattered two hits and three walks in his first shutout of the season while sending Chunichi to its sixth straight defeat. At Chiba’s QVC Marine Field, Ayumu Ishikawa (7-4) threw a seven-hit shutout against Tohoku Rakuten and Alfredo Despaigne hit a three-run home run off Takahiro Norimoto (4-7) in the first for Chiba Lotte. Buffaloes at Fighters — ppd.